Those looking for a new online casino can check out the brand new Play.Casino which has just gone live. The casino has games from well-known developers such as Net Entertainment and BetSoft Gaming and lesser known developers such as Ezugi, Endorphina and SoftSwiss. Thanks to this players can enjoy games that they are probably familiar with and also find some new titles. There is a huge range of online slots built upon many different themes as well as a good collection of video poker titles and roulette games including live dealer titles. 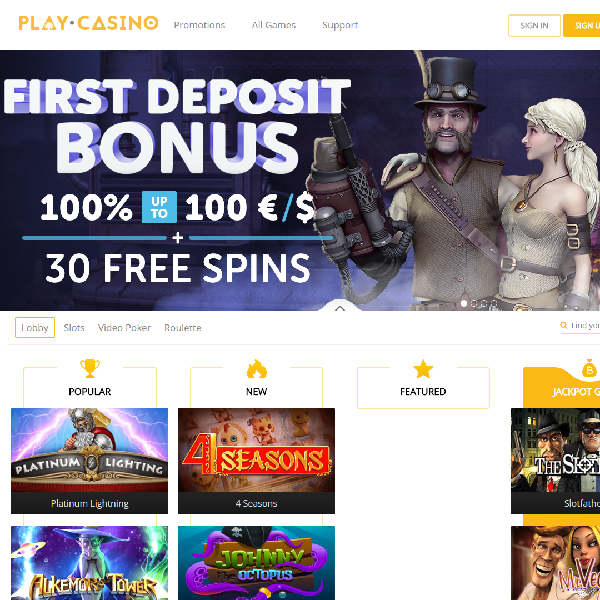 New members at Play.Casino will receive a 100% first deposit bonus of up to €100 together with 30 free spins on Steam Tower slot. There is also a 100% second deposit bonus of up to €100 with 30 free spins on Jack and the Beanstalk slot.